Baptism No 796 Henry Frederick Neal born 30 July 1903, baptised 20 April 1904. Baptism No. 797 Reita Martha Bottcher born 18 Nov 1900, baptised 20 April 1904. Baptism No. 798 Albert Edward Bottcher born 9 Nov 1902, baptised 20 Apr 1904. Stewart Henry William Neal, known as Billy was the 2nd child of Stuart and Mary Neal. He was born on 31 Jan 1902 at 8 Brown St, St Peters, New South Wales, Australia and Baptized in the St Peters church of England, Cook's River Church on the 20 Apr 1904. At the age of 23 he married Maud Taylor age 28 and born in Hobart Tasmania, the daughter of Thomas West (a carpenter) and Florence Walsh) at the Parish Church of St Peters, Cook's River, New South Wales, Australia. Maud was a widow when she married Stewart. At the time of his marriage Stewart still lived at home at 8 Brown Street St Peters and his occupation is listed as Carter. It is believed that Maud and he adopted two children and at some stage moved to 147 Victoria Parade, Fitzroy, Victoria, Australia. While many young men left Australia to fight overseas during World War II, one large group of men made a significant contribution to the war effort back home. These were the men of the Civil Construction Corps (CCC) who were responsible for building many major facilities throughout Australia during World War II. The CCC was established in the dark days of the Pacific War utilising the skills of thousands of tradesmen, building workers and labourers. The men of the CCC did a wonderful job for the Australian and US forces during World War II. They carried out their building requirements all over Australia, particularly in northern parts. It was just like being in the forces because you had to go wherever they sent you. A copy of Stewart's service record with the Civil Construction Corp is attached to his home page. Stewart enrolled in The Civil Construction Corps at 275 Londsdale Street on 18th Jan 1943 with his service commencing from 19 Jan 1943. His CC No. CV101939. He was designated a trainee cook. His Trade or Profession was listed as Cook with 12 years Experience and a member of the Cold Storage Union. His address on enlistment was 147 Victoria Pde Fitzroy Victoria. His previous address was listed as 317 Fitzroy St Fitzroy Victoria. His identity card No. was V16 M02 32892. He was described as 5ft 7 inches tall, weight 12 stone 7 pounds, Medical Status fit for Northern Territory. The record shows he allot 3 pounds to his wife Maud Neal at 147 Victoria Road Fitzroy Victoria. His medical history showed that on the 2nd July 1943 he suffered from Sinusitis Nasal Obstructions. He had an accident 3 years earlier which resulted in nasal obstructions. The trouble had increased and for the past 9 months he has had a cough with sputum, the symptoms were worse in the forenoon. He had a discharge from his nose which had a foul odor. He also suffered from a head ache and pain over his entire chest. His condition had not improved and he was placed under observation. Whilst in the Cival Construction Corps he worked from 19/1/43 to 10/2/1943 at AWC School Maribyrnong, Victoria. 14/2/1943 Department of Interior Alice Springs Northern Territory. 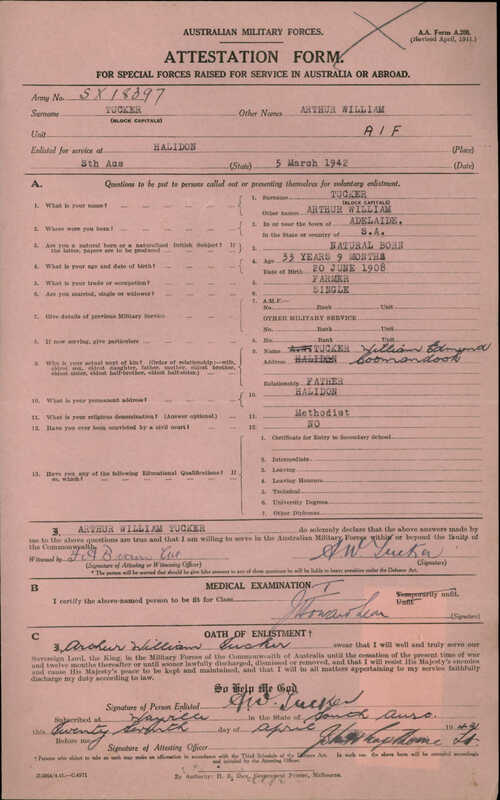 25/1/1944 medical Fit Metro Area Recall 3 mths - no work available.